Question: How do you make for killing off one of the most beloved characters in the last episode? Answer: Finally reveal the fate of a character who’s been MIA since the very beginning of the Game of Thrones story. His fate has been the source of much speculation and was long suspected of being the book character “Cold Hands” who’s been written out of the TV Game of Thrones. But much like Hodor, it’s now clear George RR Martin had plans for Ned Stark’s younger brother that meant he would have to make an appearance. And he arrives back on the scene at just the perfect moment with his nephew, Bran, in dire need of rescuing. With Hodor ‘holding the door’, it’s left to Meera to drag Bran to safety. He’s still locked in the Dream World, unaware of what’s going on in the real world. A series of images flash across the screen; Robb’s death, Jaime killing the Mad King, Eddard asking ‘where’s my sister’. All of them are potential hints of stories past, present and future. He suddenly regains consciousness as the White Wakers close in on them. Just when it seems another Stark has met his end (this IS Game of Thrones, after all) a mysterious figure in black arrives and lays waste to the undead. He later reveals himself as Ned Stark’s younger brother Benjen, whom we last saw heading off on a ranging mission for the Night’s Watch. “I led a ranging party deep into the north to find White Walkers. They found us. A White Walker stabbed me in the gut with a sword made of ice. Left me there to die. To turn. The Children found me, stopped the Walkers’ magic from taking hold”. It’s clear Benjen is aware of the mysteries of the Three Eyed Raven and the Children and with the old man now dead, it may be left to Benjen to help Bran become who he is supposed to become (pure conjecture, but you never know). This latest Stark family reunion touches on the theme of “Blood of My Blood” and much of the storylines dwell on family and kinship. Samwell and Gilly have arrived at his family home. His mother and sister greet him with loving arms and accept Gilly and her son as part of the family. Lord Randall Tarly is every bit as horrible as Sam has described. His son is a disappointment. He’d hoped the Night’s Watch would have made a man out of him. Sam remains everything that angered and disgusted him. While Sam cops the abuse, it’s Gilly who stands up to Lord Tarly and stands by her man. But in doing so, she inadvertently reveals that she’s a wildling woman. Lord Randall is furious that Sam would bring someone like her into their home. He’ll let her stay with the baby, thinking he’s ‘blood’, but Sam is banished forever. This man makes Tywin Lannister look like a warm and loving dad, who everyone just adores, not fears. At first it seems Sam will meekly go along with his father’s command and says his goodbyes to Gilly as she offers these last words to him. “You’re not what he thinks you are, Sam. He doesn’t know what you are”. He walks out the door and just as quickly returns, telling Gilly to pack up all her things. “We’re leaving. We belong together. All of us”. Sam has more honour than many in Westeros and he’s a bit of a thief, because on the way out he pilfers dad’s sword, Heart’s Bane. It just happens to be made of Valyrian steel, which is rather lethal on ice zombies and their overlords. Might just come in handy. In Braavos, Arya returns to watch the actors play out the story of her family’s demise, knowing that she has a mission to complete for the Faceless Men. She laughs as Tywin Lannister (Richard E Grant) is murdered on the toilet, but is mesmerised by Lady Crane’s portrayal of Cersei as she mourns Joffrey’s death. She steals away to lace her alcohol with poison, but runs into Lady Crane backstage. Arya is recognised, but isn’t suspected of being an assassin. Instead, Lady Crane thinks she’s run into a kindred spirit. They have connection and Arya’s clearly torn by what needs to be done. Just as the actress prepares to drink from the poisoned chalice, Arya knocks the glass from her hand and points out who wants her dead. And who should be watching, but The Waif who runs off to tell Jaqen H’ghar. The Waif is coming after her but Arya is prepared. She’s retrieved her sword, which could very well be a metaphor for her old life. The sword is back and so is the old Arya and she will have a score to settle with The Waif. In Kings Landing, family is again central to events that are being played out. “I have had lots of time to think about how good I was at seeming good. It’s such a relief to let go of those lies”. I was willing to bet she was pretending to have found the light to protect her brother Loras, until Jaime’s showdown with the High Sparrow. Jaime gallops up with the Tyrell Troops demanding Margaery and her brother be handed over immediately. But the High Sparrow refuses, even though he says every Sparrow would be willing to die in the service of the Gods. But there’s now no need for Margaery to make her Walk of Atonement as she’s been forgiven of her sins already. And how has she managed to do that? 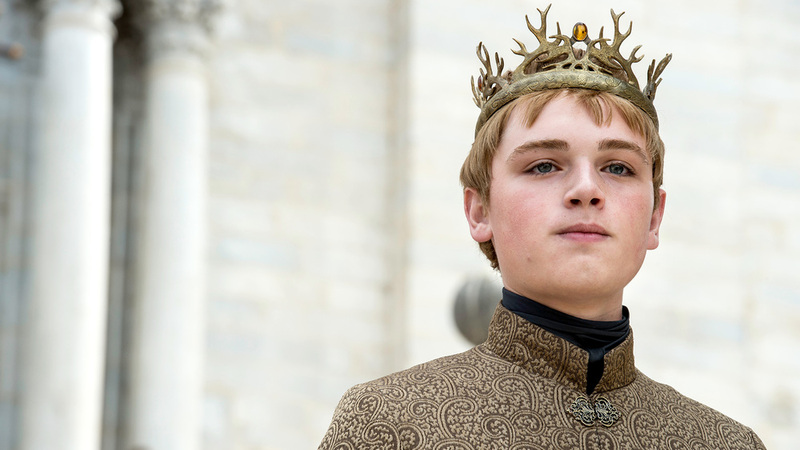 She’s ‘turned’ Tommen and together they have forged a new Holy alliance between the Crown and the Faith. And together they will ‘restore the Seven Kingdoms to Glory’. That would be Checkmate, Jaime. And what did that near civil war earn Jaime? Well, is son-and-king has gone and kicked him out of the King’s Guard and has kicked him out of Kings Landing. The baby Lannister Lion has bared his teeth. Jaime wants to tear apart the High Sept to retrieve his son, but Cersei tells him to follow orders and help out Walder Frey and regain Riverrun. Then they kiss and ‘twincest’ has returned to Game of Thrones. The closing minutes of the episode belong to the Mother of Dragons. Daenerys is leading her new Khalasar back to Meereen, when she notices something in the sky. She orders the Dothraki to wait where they are as she rides off. She returns on the back of Drogo, who has grown into a magnificent beast. She whips her Dothraki horde into a frenzy as she makes them promise to ‘ride wooden horses across the Black Iron Sea’. They roar their acquiescence as she asks them to give her the Seven Kingdoms. And that closes out episode six. Not with the heart-wrenching emotion of Hodor’s death, but adulation of the masses.